Whether or not you are are staying with us, we are happy to host a private event for your birthday, stag or hen due, anniversary, family reunion or company workshop. Just you and our view! Here are some concrete ideas, contact us for more information or to book. Come on a private walking tour of our neighbourhood with us to discover things you otherwise wouldn’t notice! We love to share those little secrets with you because they reflect the true Barcelona, often hidden by mass tourism. This is not a typical touristic tour, but rather the personal route of Petz. Upon special request, Petz can also discuss the eco-renovation and sustainable aspects of yök from the eco-designer’s perspective. Available for groups of 4-8 people in English, Spanish, German, French and Luxembourgish. 120€/group of max. 2. +30€/extra person. Immerse yourself in the world of Catalan wine and culture. Cristina, a friendly and experienced sommelier, pairs the stories of 5 organic wines with Barcelona: local design, architecture and sustainability. The wines are carefully selected from small independent producers. Enjoy 2 reds, 2 whites and a sparkling wine in a 2h tasting session at our exclusive #terrazayök with amazing views. A unique experience for wine, history and culture enthusiasts. A wine tasting with a twist. Nibbles and snacks are also provided. Available for groups of 4 to 8 people in English, Spanish, Catalan and German. For larger groups, please contact us. Price: 275€/group of max. 4. +50€/ extra person. 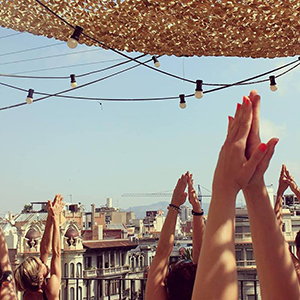 Enjoy a personalised Vinyasa Flow class with yoga teacher Olga, and then tuck into a delicious, locally-sourced meal prepared by cook Héctor. All whilst taking in one of the most amazing terrace views of Barcelona. Available for groups of 4-10 people in English, Spanish, Catalan and French. 300€/group of max. 4. +50€/ extra person. 175€/ group of max. 4 people. +25€/ extra person. Contact us if you want a one on one class with Olga. 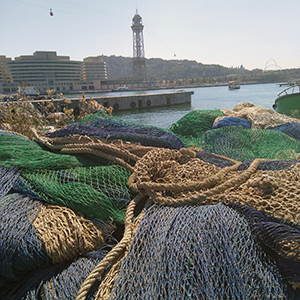 Meet the Barcelona fishermen and enjoy a seafood dinner. This is a unique experience by our friends Cristina and Guillermo. They take you to Barcelona’s only fishermen harbour (usually closed to the public) where you can see how the fresh fish arrives and gets auctioned off. You will learn about the different fishing methods and what fish is sustainable. Afterwards, you’ll be taken to a Slow Food fish restaurant to taste fresh, locally sourced fish and seafood in a gastronomic tapas dinner served with organic and natural wine pairing. Read about this experience on our blog. 130€/person, group of 8 people. 160€/person, group of 4 people. 16h from Monday to Friday. 3,5 hours more or less.